FlowDance is a game that combines dance and music. 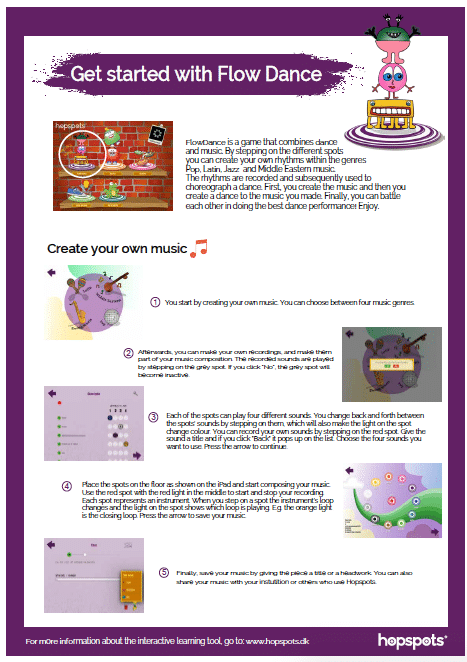 First, the children choose between the music genres: Pop, Latin, Jazz and Middle Eastern, after which they can record and add their own sounds to the game. The red spot is the record-button, the grey spot contains your own recordings and the rest of the 10 spots each represent a music instrument e.g., bass, guitar, piano etc. Every spot/instrument has 4 loops of 3 seconds duration, which allows you to make breaks, intermezzos and cool endings. Thus, you can make your own music by jumping around on the different Hopspots. After the children have recorded a piece of music by combining the sounds on the spots, they can choreograph a dance for the music. In order to choreograph the dance you must dance on the spots in a rhythm and way you think fits with the music you just made. Afterwards, you can challenge each other in the dance to see who can get the most points. You do that by dancing on the spots as the light on them shows you – they will light up in the order and rhythm as when the dance was made. The spots are going to show you the dance in the form of white light that pops up in the recorded rhythm, which you then have to step on in time to get points. With FlowDance you can activate the entire class when collaborating on making music and dances. The app registers the number of times and the order in which you step on the spots. Thus, you choose whether to use just a few or all of the spots. You can for instance divide the children into groups and give each of the groups a number of spots to dance on. The possibilities vary greatly in FlowDance. You can use it for a game of freeze dance, play music with the spot instruments perhaps in combination with real physical instruments, choreograph and challenge each other in funny dances and so on. The game is highly applicable in music classes, but can also easily be used for active breaks or entertainment, where the children burn some energy and heighten their spirits. FlowDance is a fun way of playing with music and movement, for everyone – children as well as adults. 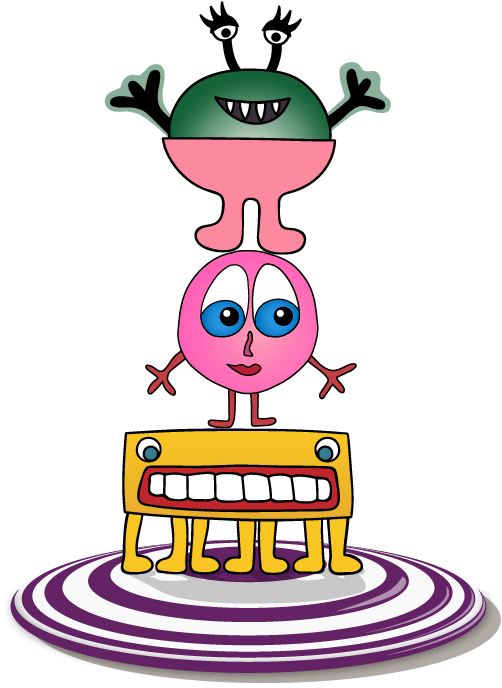 The game is designed by pupils at Uglegårdsskolen in Zealand, Denmark, who beat three other Danish schools in a competition on developing a new game for Hopspots. FlowDance is thus invented and tested by children! Here you will find the guide for FlowDance that shows you how to play step by step.